Take a look at the movie "Chariots of Fire" for a great clip about ultimate allegiance. Eric is forced to stand in front of the prince and the chair of the Olympic committee and literally choose between allegiance to the state and allegiance to God. "Together in Christ," Kathryn Matthews, Semon Seeds, 2016. 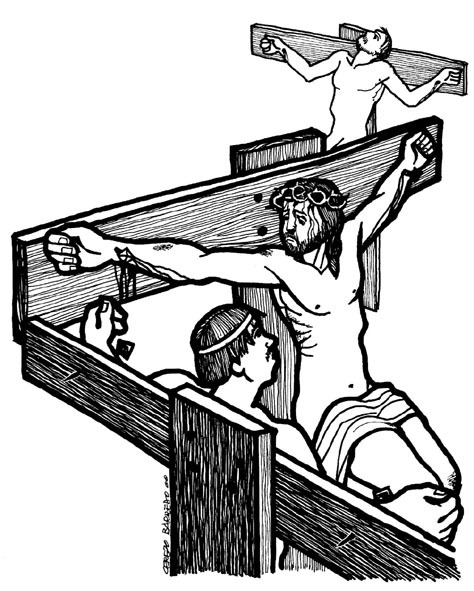 "'Christ the Crucified' Sunday," D. Mark Davis, Left Behind and Loving It, 2013. The Lectionary Lab, The Reign of Christ, the Rev'ds Dr. John Fairless and Delmer Chilton (aka "Two Bubbas and a Bible"), 2013. Lectionary Lab Live podcast. "Preaching 'Reign of Christ' Sunday as a Progressive Christian," Carl Gregg, Patheos, 2010. Comments (commentary) and Clippings (technical notes for in-depth study), Reign of Christ C, Chris Haslam, Anglican Diocese of Montreal. 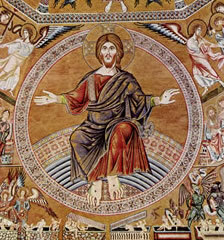 Girardian Reflections on the Lectionary, Christ the King, by Paul Nuechterlein & Friends. Jesus Now, Proper (Ordinary) 34C. Lectionary, study and worship resources from Faith Futures Jesus Then & Now. "Who and What Is Your King?" Karoline Lewis, Dear Working Preacher, 2016. "What Kind of King Do You Want?" David Lose, ...in the meantime,2016. "Heeding God's Relentless Demand for Justice," Keith Anderson, ON Scripture, 2016. Living by the Word, Scott D. Anderson, The Christian Century, 2016. "Kingdom of the Son," John W. Martens, America, 2016. Christ the King C, Terrance Callan, Mount St Mary Seminary, 2016. "A King for This Hour," Debie Thomas, Journey with Jesus, 2016. "Temporal and Eternal," Suzanne Guthrie, At the Edge of the Enclosure, 2016. "What Kind of King?" David Sellery, 2016. "Not Saving Self? What's with That?" Glenn Monson, Law & Gospel Everywhere, 2016. "At the Brink of Times," Nancy Rockwell, The Bite in the Apple, 2016. "Be Still, Steward!" Sharron Blezard, 2016. "For the sake of all for whom Jesus Died," Janet H Hunt, Dancing with the Word, 2016. "Inheriting light," Melissa Bane Sevier, Contemplative Viewfinder, 2016. The Reflectionary, Fay Rowland, reflections and activities, 2016. "Kingdom of the Son," John W. Martens, America: The National Catholic Review, 2016. "God's Kingdom Breaking In," Casey Cross, Modern Metanoia, 2016. "The King of Second Chances," David Lose, Dear Working Preacher, 2013. "The Death of Thanksgiving," Henry G. Brinton, ON Scripture, Odyssey Networks, 2013. "YHWH Is Our Righteousness," John C. Holbert, Opening the Old Testament, 2013. "What Kind of King Is This?" Alyce M. McKenzie, Edgy Exegesis, 2013. "'They Say There's Another King, One Called Jesus,'" Daniel B. Clendenin, The Journey with Jesus: Notes to Myself, Journey with Jesus Foundation, 2013. 2007. "Remembered," Janet H. Hunt, Dancing with the Word, 2013. Draughting Theology, Steve Pankey, 2013. "Today You Will Be With Me in Paradise," Theological Stew, Linda Fabian Pepe, 2013. "At the Feet of the King," Sharron R. Blezard, Stewardship of Life, 2013. "What Kind of King?" David Sellery, 2013. Care for Creation Commentary, Leah Schade, Lutherans Restoring Creation, 2013. "Attentiveness to God's Reign," Daniel Benedict, Upper Room Books, 2013. "Temporal and Eternal," Suzanne Guthrie, At The Edge of the Enclosure, 2013. "What Kind of King?" Christopher Burkett, PreacherRhetorica, 2013. "Of Taunts and Thieves," Thomas Beam, 2013. "Giving Thanks," sermon discussion from Frederick Buechner, Frederick Buechner Blog. "Declare that the Dawn Is Coming," Robb McCoy, The Fat Pastor, 2013. "A Hero for Our Time," Steve Goodier, Life Support System, 2013. Christ the King, Alyce McKenzie, Patheos, 2010. "Christ the King, Christ the Head," Paul Bellan-Boyer, City Called Heaven, 2010. The Saturday Night Theologian, Reign of Christ, Exegesis of Word and World, Tod O.L. Mundo, Progressive Theology Weblog, 2007. Dylan's Lectionary Blog, Last Sunday after Pentecost, Year C, 2004. (Episcopal Lectionary) Biblical Scholar Sarah Dylan Breuer looks at readings for the coming Sunday in the lectionary of the Episcopal Church. "The Reign of Remembrance," Elaine Dreeben, Day 1, 2016. "Today!" by Michael Renninger. A Sermon for Every Sunday. Video sermons from America's best preachers for every Sunday of the liturgical year. "The King of Love," Sil Galvan, 2016. "What does 'king' mean to you?" the Rev. Machrina L. Blasdell, Sermons that Work, Episcopal Digital Network, 2013. Fiesta de Cristo Rey(C) – 2013, el Rvdo. Gonzalo Antonio Rendon-Ospina, Sermones que Iluminan. "Be Still," sermon discussion from Frederick Buechner, Frederick Buechner Blog. "Image of the Invisible," the Rev. Dr. Fred R. Anderson, Day 1, 2007. Christ the King Sermons, Pastor Edward F. Markquart, Grace Lutheran Church, Seattle, Washington. Feast of Christ the King, Andrew M. Greeley, "author, priest, sociologist," 2004. Father Andrew M. Greeley, "Priest, Author, Sociologist," Commentary and Homily, 2001. "Seeking Unity," Faith Element, 2013. "God's Path of Peace," Weekly Seeds, UCC, 2016. Bible Study, Christ the King, 2013, Joseph Farnes, Seminary of the Southwest, Sermons that Work, Episcopal Digital Network. Estudio de la Biblia. Fiesta de Cristo Rey (C) por Joseph Farnes, Sermones que Iluminan, 2013. "Light to Those Who Sit in Darkness," Proper 29C, Lesson Plans that Work, Episcopal Digital Network, 2013. "The Christian Way of Knowing," study guide, Robert B. Kruschwitz, (other resources at) "Where Wisdom is Found," Christian Reflection, The Center for Christian Ethics at Baylor University, 2009. (Colossians 1:15-20) Focus article, "The Christian Way of Knowing," Jonathan R. Wilson. Worship and Liturgy Resources, Pentecost 25, by Rev David Beswick, Uniting Church in Australia. Worship Resources, Rev. Mindi, Rev-o-lution, 2013. LCA Worship Planning Page, Last Sunday of the Church Year, "Everything lay-readers need to prepare worship." Mustard Seeds, "Servant Power," Christ the King C, 2013. A lectionary-based ideas resource for leaders of contemporary worship, Ann Scull, Gippsland, Australia. Worship and Liturgy Resources, Ordinary 33, by Rev David Beswick, Uniting Church in Australia. Lectionary Liturgies, Ordinary 33, Thom M. Shuman, Presbyterian Church (U.S.A.). Liturgy for Christ the King Sunday, Rev. Thomas L. Weitzel, Evangelical Lutheran Church in America. The Billabong, Reign of Christ, by Rev Jeff Shrowder, Uniting Church in Australia: Hymn suggestions and paraphrases of lectionary Psalms. HermanoLeón Clipart, Christ the King. Free clipart, backgrounds, slides, etc. Clip Art, Christ the King C, Fr. Richard Lonsdale, Resources for Catholic Educators. Clip Art Images: Luke 23:33-43, Luke 23:33-43 #2, Misioneros Del Sagrado Corazón en el Perú. Christ the King at Cerezo Barredo's weekly gospel illustrations. Follows Latin American Roman Catholic gospel reading. Liberation emphasis. The sign above Jesus during the crucifixion, audio telling, story in episodes, graphic, audio and written commentaries. Go Tell Communications, Biblical Storytelling for the Global Village, 2010. "Apron," video, John Stevens, Dollar Store Children's Sermons, 2013. "The Death of Thanksgiving," Henry G. Brinton, ON Scripture, Odyssey Networks, 2013. (Video: What people are thankful for). ST. CHRISTOPHER 7.6.8.6.8.6.8.6 ('Beneath the Cross of Jesus') A new hymn lifts up a number of biblical themes related to justice, mercy, prison, even the death penalty, with reference to Jesus on the cross asking God to forgive. The United Methodist Worship Office has this hymn with the music as a free, downloadable file. Psalm 46 set to Sweet Hour (LMD) by Dale A. Schoening, Metrical Psalms. Hymn and Song Suggestions, Reign of Christ / Christ the King, 2016, annotated suggestions from Natalie Sims, Singing from the Lectionary. Worship Resource Manual, The Moravian Church, Southern Province. Worksheets for planning music in worship: hymns, anthems, solos, organ repertoire suggestions for RCL texts. Direct link to Reign of Christ. Choral Anthem Project, Ordinary 34C / Christ the King, National Association of Pastoral Musicians. Sing for Joy, Christ the King, 2007. Choral reflections on this week's lectionary readings, St. Olaf College. "Storypath Lectionary Links: Connecting Children's Literature with our Faith Story," 2016., Union Presbyterian Seminary. "The End Is the Beginning (Without End)," Fran Woodruff, On The Chancel Steps, 2013. "King Backward," Charles Kirkpatrick, Sermons4kids.com. Story for Children's Worship and Family Activity, Ordinary 33, at word-sunday.com: A Catholic Resource for the Lectionary by Larry Broding. Christ the King Wordsearch, Charles Kirkpatrick, sermons4kids.com. Lectionary Puzzles, Reign of Christ/Christ the King. Word search puzzles in RTF or plain text, by Reg McMillan, St.Stephen's Presbyterian Church, Peterborough, Ontario.